I'm using a configurable list widget to capture various personal information with many of the fields being mandatory. However, what seems to be happening is that when only ONE mandatory filed is entered, the user is able to move onto the next page without completing ALL the mandatory fields in the widget. Thank you for contacting us. Unfortunately, I was able to reproduce this issue and confirm that only the first required field gives you a warning. 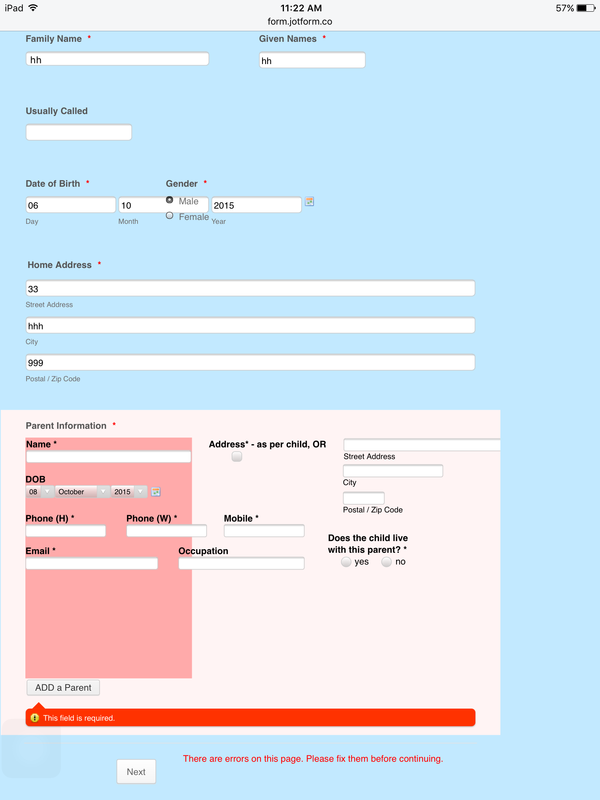 I did notice that it will not enable you to submit the form until you finish filling all the required fields. I have forward this to our back end team. They are currently working on the issue and will get back to you as soon as this gets fixed. 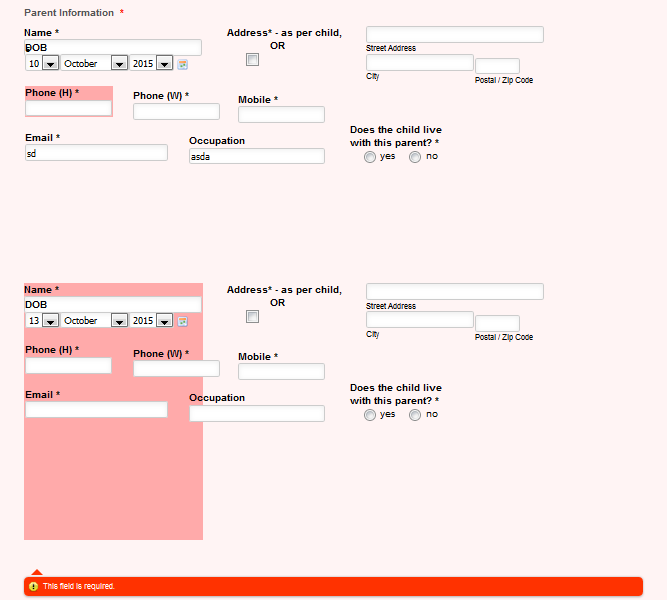 I am able to submit the form, WITHOUT filling in all the required fields in the Configurable List. - with dummy entries on regular fields, the configurable list fields showed warning messages on required fields (also won't proceed to the next section). Yes, but if you complete ANY ONE of the mandatory fields in the Configurable List widget, it allows you to go to the next page, and submit the form, even though OTHER mandatory fields in Configurable List widget have not been filled. Thank you for all the new information. I have updated our back end team with all the new information given. They are currently working on the issue and as soon as this is fixed. we will let know now through this post. Are the developers changing the PRODUCTION version of this widget whilst people are using it? It has been behaving erratically all day today. We are using the Configurable list widget in other forms and our clients are complaining that they cant move to the next page. It is saying there are errors on the page, but there is nothing in red to indicate errors. I've also noticed that when I add a configurable list item and click next without completing all the mandatory fields, the REMOVE button disappears and I cannot remove that record. Finally, I cannot view any of the fields in the configurable list whilst in the form editor, the widget is blank. I can still view the names of the fields in the wizard, and view the properties, but the fields themselves are not showing. I've done some more testing and this is what appears to now be happening. When you have mandatory fields in a Configurable List widgets, and you ADD a new records, the REMOVE button disappears and you MUST add all the mandatory fields for that record before the REMOVE button appears again. This does not seem user friendly. If someone accidentally adds a new record and there are lots of mandatory fields to complete for no reason at all. It is also not very intuitive to the end user. Also, before these changes were made, I was able to have a configurable List widget with a 'minimum rows' set to ZERO, so that widget itself is optional, but if someone does want to add the information to the form, it still had mandatory fields. What happens now is that you can't progress to the next page until the mandatory fields are completed, even though the end user has NOT added any records. Thank you for contacting us. I have tried to replicate this issue today, but was unable. I think this issue that you have found are already fixed. I will forward this issue to our development to confirm if they have been fix correct. The ticket that was forward to our back end is still open, indicating that they are still working on this widget. As soon as this widget works properly. You will get an update on this thread. Has it been fixed yet? I haven't had a confirmation. The fix for this problem seems "on-going", so currently, our developer team are on this issue. Also, I confirmed that the error which hides "Remove" button, while "This field is required." message appears. But, it won't let users to proceed to the next section. Please, try it and give us feedback about it. Yes, the Remove button is still disappearing and you must enter ALL the fields, before you can remove a record. Don't need to worry, I added this one too. It will be fixed soon. Required validation has been fixed - please check and let us know. 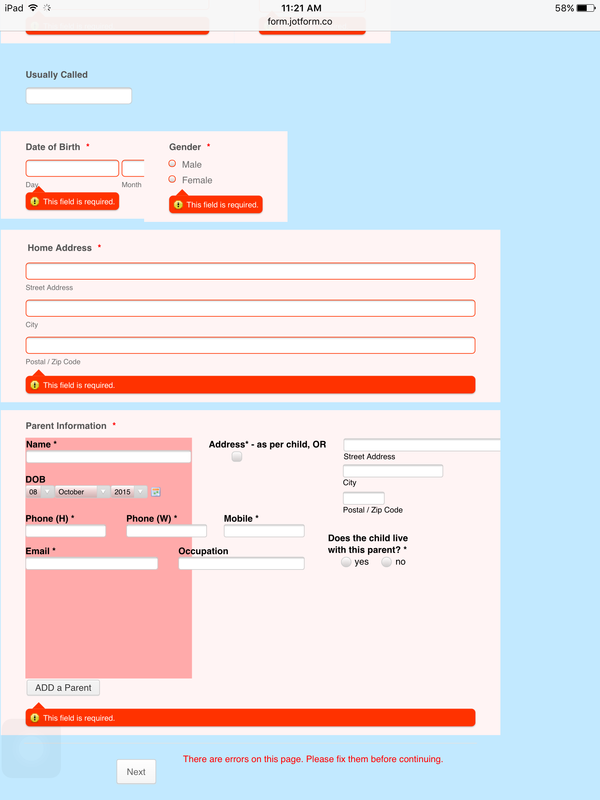 As for the Remove button disappearing, this is a layout issue and can be fixed with custom CSS for your form. If you need assistance on that front, please let us know and we'll oblige.